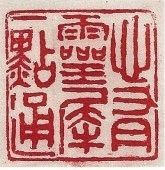 Chinese seal engraving using the seal script. The engraving wording is a 7-words Chinese idiom which literal translation is mind acts upon mind. Usually, Chinese seal is engraved with a person name and seldom there is idiom being engraved. I designed to engrave Chinese idiom because Chinese seal is very often stamped on Chinese painting and calligraphy pieces. The conceptual idea of this seal of idiom is when stamping on Chinese painting which has a great area of blank leaving, it would give a great sense of zen, which is a common pursue of Chinese art.